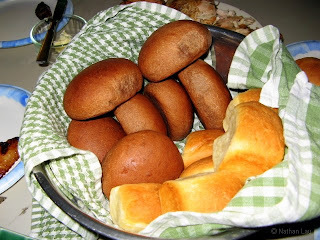 What are the best dinner rolls you ever ate? I remember once eating some great bread in a steak restaurant near Provo, Utah. Forget what they were called, but they were good. When Annie and I were dating, every so often we'd go have the buffet at the Plumeria Beach Cafe in the Kahala Hilton on Oahu. Besides the awesome spread there (oh, for the days when we could eat lots more and not worry about the weight), they had a basket of rolls with different selections from regular to whole wheat to sourdough to taro. The taro bread was especially good. Annie made these two types of dinner rolls for us the other night. The first was "Butter-Dipped Dinner Rolls" from "The Bread Bible" and the second was "Dark & Soft Restaurant Dinner Rolls" from "Whole Grain Baking" by King Arthur Flour. 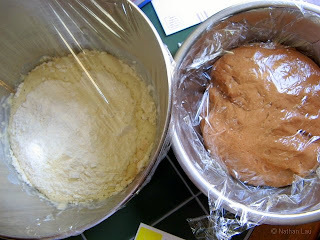 Here are both doughs rising before shaping. These were the best rolls I've had in a very long time. I forgot where and when I had dinner rolls. But my criteria - dinner rolls got to be warm and fresh...I do not like cold, hard and stale dinner rolls.